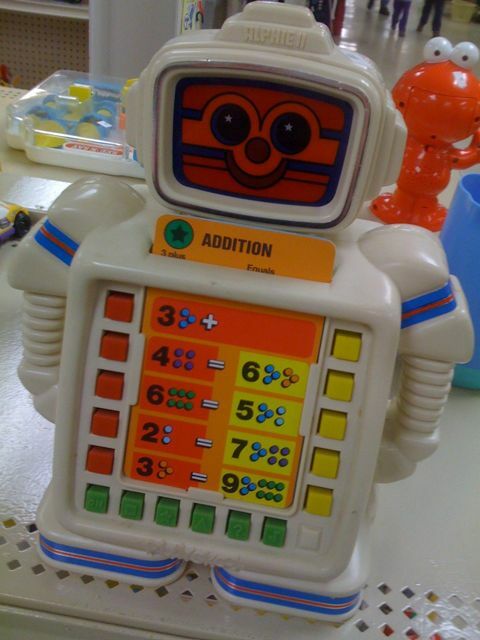 The first electronic toy computer I remember playing with was Playskool’s friendly Alphie II. I’ve always had a fascination with how electronic devices interface. This little robot may be where it all comes from. The buttons along the bottom corresponded with an icon on the top of the various theme cards. Eventually I figured out that the cards were totally irrelevant. The bottom row of program buttons followed a predetermined question pattern. One could get the “right” answers by memorizing the pattern. I regret not paying the $1 adoption fee for this benevolent robot at the thrift store.